Advertiser.ie - VINYL NIGHT - Listen to your favourite artists as they were meant to be heard! Guns N' Roses Appetite For Destruction and Amy Winehouse Back In Black. Vinyl lovers and collectors can browse albums as OMG (Zhivago Galway ) will have a selection of Vinyl’s for sale on the night- you may pick up the perfect Christmas Gift! Whether you are an older listener try or younger listeners searching for an authentic experience, vinyl records have become more popular over the last decade. Vinyl is also about sitting down and listening attentively, as opposed to the ease of playing streamed music in the background. If you put on an album, it’s probably with the specific intent to sit back and enjoy it. Guns N Roses Appetite For Destruction was released in 1987 and sold 30 million copies. Singles on the album include 'Welcome to the Jungle' 'Sweet Child O Mine ' and ' Paradise City '. Appetite is one of those classic albums that get you ready for a night out OUT! Back In Black by Amy Winehouse was released in 2006 and sold 12 million copies plus 5 singles were released off it 'Rehab' 'You know I'm Good' 'Back In Black' 'Tears Dry on their own' ' Love is a losing game' Back in Black is an album to be drank with Wine! 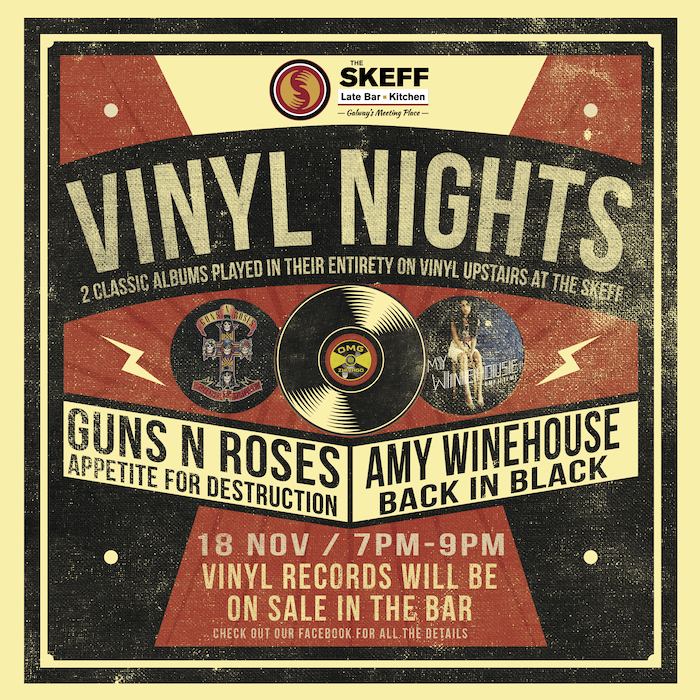 Vinyl Night | Sunday 18th November | 7pm-9pm | Upstairs @ The Skeff| No Cover Charge - See Social media for more details.